With a PNW winter in full force here in the Pacific Northwest, it's a time for snuggling under blankets and downing mugs full of frothy hot cocoa. Were snow is scarce, but rain is not, going outdoors is none too enticing. Braving the forecast of rain on the horizon, Tucker and Aubrey woke up before dawn to head out toward Mount Rainier to shoot with me. Raindrops scattered the car window and the air had a crisp, lingering dampness when drops were few and far between. We kept our fingers crossed that the downpours would come another day and headed out to our beautiful location. My dreams are filled with overcast mornings like this; rolling with tendrils of clouds trailing through the hillsides. The exchange of a bit of misty air and occasional raindrops seemed fair enough. When we got to our shoot spot, we chatted for a quick moment about what they wanted out of the shoot and their direction style. 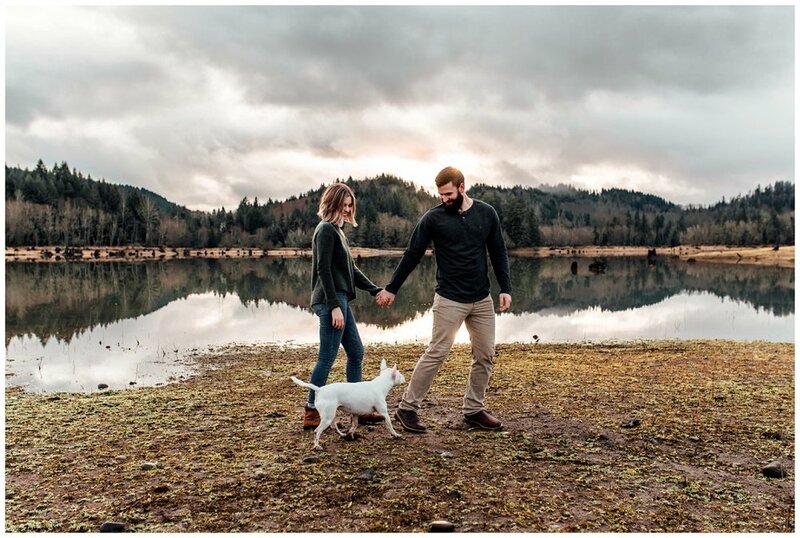 Aubrey was thrilled to have photos of her little family, specifically wanting to get shots with their adorable dog, Kokanee. I've really been gearing up for more shoots depicting the mood of each individual relationship, and moving away from doing a lot of posing. 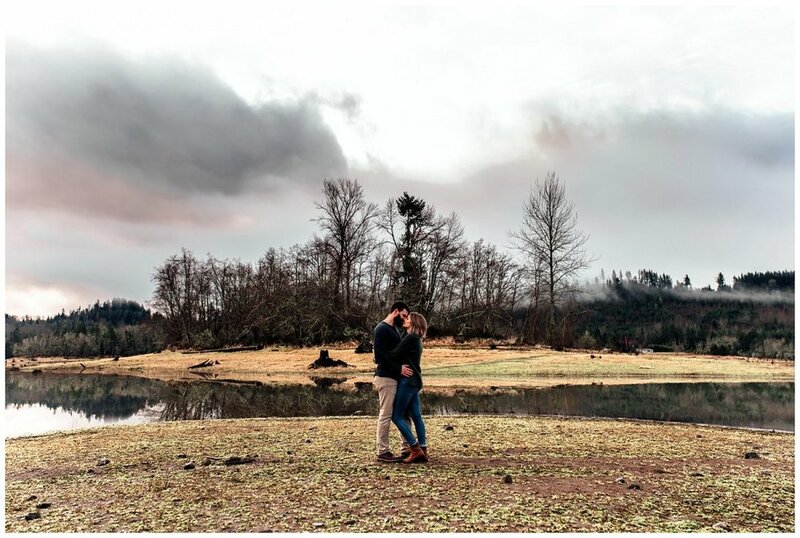 Tucker and Aubrey embraced the lack of traditional posing and had so much fun throwing sticks (occasionally mini logs) for Kokanee, spinning and laughing and taking the small moments to feel the serenity evoked by warm embraces and shoulder kisses. From muddy puppy paws to bear hugs, this is a shoot you won't want to miss. Brittingham Photography specializes in natural High School Senior portraits, but also offers Britt Beauty Sessions (individual women's shoots), Lifestyle Newborn, Couples Sessions and Intimate Family Photos. Thank you for stopping by to read my little blog!